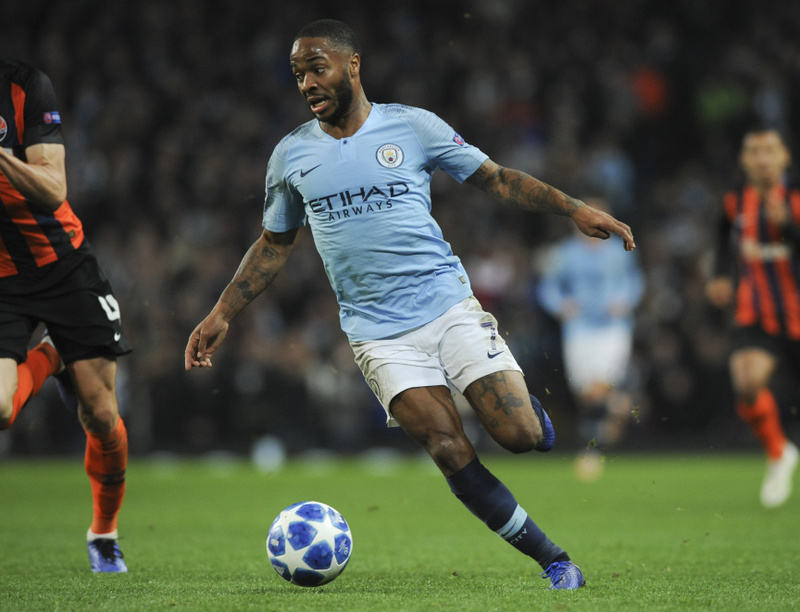 MANCHESTER, England (AP) — Raheem Sterling went from the farcical to the sublime in helping Manchester City to a 6-0 win over Shakhtar Donetsk and the brink of qualifying for the Champions League knockout stage on Wednesday. The England winger provided the main talking point in another convincing victory for City when he stubbed his toe in the turf as he attempted a shot in the 24th minute and toppled over. Referee Viktor Kassai awarded a penalty despite there being no contact with a defender — much to the amazement of Shakhtar's players, some of whom even laughed at the decision — and Gabriel Jesus converted the spot kick for 2-0 and the first of his three goals on the night. "We don't like to score a goal in that situation," City manager Pep Guardiola said. "It was really clear." Sterling showed much more poise in scoring City's third goal, by picking up the ball 40 meters out, powering through two would-be tacklers and curling a fierce shot into the top corner from the edge of the area in the 48th. It was the run and finish of a man in form, with Sterling having scored twice in the Premier League this past weekend as well. Jesus made it 4-0 in the 72nd, again from the penalty spot after David Silva was tripped by Taras Stepanenko, before Riyad Mahrez and Jesus — with a goal that completed his hat trick — wrapped up the scoring. Silva had put City 1-0 ahead with a close-range finish in the 13th. City stayed in first place in Group F, but moved three points ahead of Lyon after the French club drew 2-2 against Hoffenheim. The English champions need one more point from their last two games to be certain of a top-two finish. After City's latest attacking masterclass, it was the penalty decision — given by a referee who has officiated in a Champions League final and in World Cups — that will best be remembered. It led to Sterling trending worldwide on social media. It was so obvious that Sterling tripped himself over, rather than being fouled by chasing Shakhtar defender Mykola Matvyenko, that Guardiola covered his face with his hands after the incident before wagging his finger toward his own bench , indicating the penalty should not have been awarded. Sergio Aguero, a substitute sitting just in front of Guardiola, had a smile on his face. The official behind the goal — used in UEFA-run competitions instead of a video assistant referee — appeared to have a good view of the trip but somehow didn't spot it. "The referees, I said a long time ago, must be helped," Guardiola said. "They want to make a good performance, they don't want to make mistakes. But today the game is quick, fast; the players are more skilled. "It takes three seconds, four seconds, 10 seconds, for someone involved to say it's no penalty, carry on." Sterling looked slightly sheepish as he walked away from the spot where he fell, and didn't tell the referee there had been no contact from an opponent. Asked if Sterling could have owned up, Guardiola said "he could do that, yes" before pointing to a goal City had wrongly disallowed in the second leg of last season's quarterfinal against Liverpool. City has scored 23 goals in its last six games in all competitions, heading into a derby against Manchester United in the Premier League on Sunday.